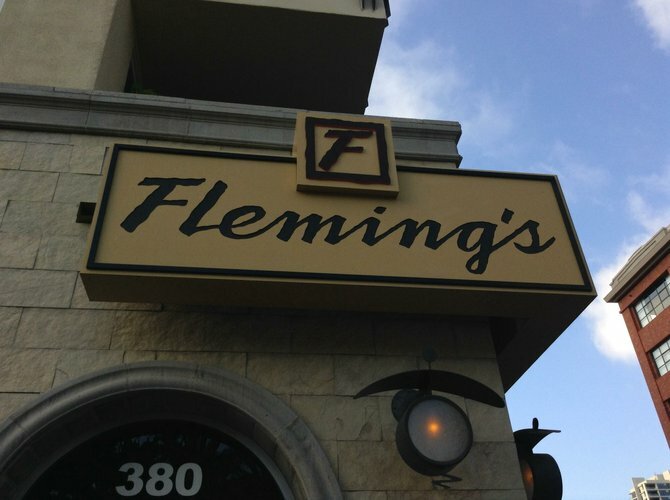 Fleming's is an expensive steakhouse. Plus it's a chain restaurant, part of a bigger chain. But it has surprisingly generous deals in their daily happy hour. You can definitely get out full-bellied for under $10. Monday 5–7pm: Five cocktails, five wines, and five appetizers, $6 each. Tuesday 5–7pm: Five cocktails, five wines, and five appetizers, $6 each. Wednesday 5–7pm: Five cocktails, five wines, and five appetizers, $6 each. Thursday 5–7pm: Five cocktails, five wines, and five appetizers, $6 each. Friday 5–7pm: Five cocktails, five wines, and five appetizers, $6 each.